Welcome to the web site for the Village of Sloan! Sloan is a small municipality located between the city of Buffalo and the town of Cheektowaga in beautiful Western New York. With a population of around 3,000, Sloan is a close-knit community of neighbors who truly look out for one another. Our Senior Center is the hub of a thriving community of Seniors from Sloan as well as surrounding communites. Also located in the Piekarski Center, the Youth Recreation Dept. provides a safe environment and activities for children of Sloan residents. Sloan is part of a great school district, has very reasonable property values, and residents of all ages enjoy a number of community events throughout the year! The Village is also home to many successful businesses. We hope you enjoy your virtual visit to our community! We look forward to seeing you in person very soon! Street light out near your home? Click here to report an outage (Link opens in new window/tab). Be sure to include the pole number or the street address so NYSEG knows which pole to fix. Please visit the Contacts page for a printable list of important phone numbers such as police, fire & other emergency numbers. • You May Be Eligible for Insurance Discounts! Since the Village shares the same zip codes with the City of Buffalo, it is very important that you check your automobile and homeowners insurance policies to make sure it shows Sloan, NY NOT Buffalo, NY. 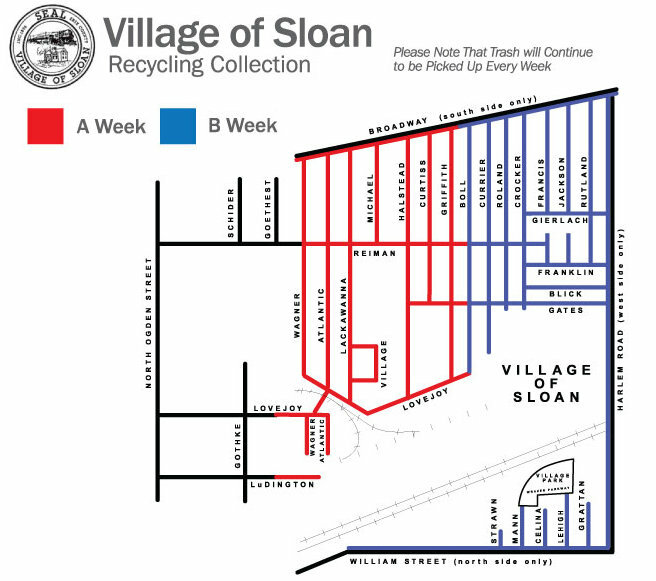 Your annual premium is less if you are located in the Village of Sloan. If any resident needs a letter addressed to their insurance company validating that you are a resident in the Village, please contact us at 897-1560 or come in to Village Hall Monday-Friday during regular business hours. • Which Recycling Schedule covers your street? “A” Red Week - Wagner, Atlantic, Lackawanna, Village Lane, Michael, Halstead, Curtiss, Griffith and those portions of Broadway, Reiman, Gates and Lovejoy west of Boll Street “B” Blue Week - Boll, Currier, Roland, Crocker, Francis, Jackson, Rutland, Harlem, Gierlach, Franklin, Blick, those portions of Broadway, Reiman, Gates and Lovejoy that are East of Boll, and the Southside of Sloan off William Street. Click the image below to view/print the Recycling Map • For a list of acceptable items for recycling, please visit the Village Clerk’s page and scroll to the bottom of the page. • Additional totes available for purchase at Village Hall: $45 for 95 gallon totes $42 for 65 gallon totes* *Recycling totes are only available in 65 gallon Totes can be delivered to your home if you are unable to take them with you.